In current time, content seems a backbone of SEO efforts that helps to present company’s presence in search rankings. It is important to know what is going around content marketing and what kind of topics and posts are getting hot in current time. To do so, a relentless and independent analysis tool is essential that can lead us with the current content topic. 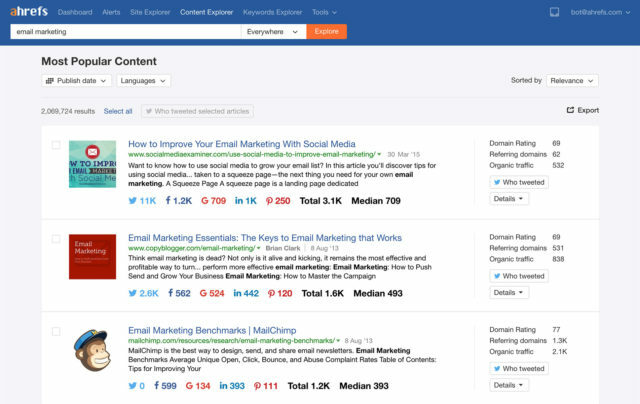 Ahrefs content explorer helps to define the effectiveness of the content, so you can take effective measures to improve the content. You must know the use of content explorer, features, and its advantages. Ahrefs Content Explorer is a well-designed and most functional tool that helps to find current trends and topics in the particular industry. You have to type a relevant search query in the search box and there will be a list of a most demanding content topic with their social sharings. The social sharing shows the popularity of a particular post on various social platforms including Facebook, twitter, G+, and Pinterest. You can filter the content as per your needs such month, year and hour basis. Conetent explorer will help to find current trends in the industry as well future planning to write an article. You can get the list of websites or blogs where you can make an approach to content marketing. If the website or blog enables Google Adsense for monetary purpose, then you can target your audience directly using a Google Adwords text or display ads. You can also get the list of referring domains (RD) that particular topic, which helps you to build an effective content marketing strategy. You will receive the regular updates on your preferred topic by creating an alert list. For future record, you can export the content related record with signing in the tool. If you are not an English origin, then do not need to be anxious because Ahrefs centent explorer tool supports a facility for different languages like Spanish, Russian, Chinese, Africans, etc. With this tool, you can discover content in different languages as per targeted audience. For example, if your local or targeted audience is Russian and your requirement is finding the current trends and topics in local language, this tool allows you to find the list of local websites. This feature helps to reach people from every corner of the globe. With content explorer tool, you can choose the best topics that the audience around the globe love to attach with. Even to get knowledge about graphical presentation, you can click on “Trend tab” next to “Table tab”. Here, the graphs illustrate the high and low popular content. When you hover your mouse on the graph, it shows the total number of low, medium and high popularity content along with the specific date. When you click on “Tiles tab” placed next to “Table tab”, a content explorer offers you a chance to get a category wise content arrangement like most popular content, title wise, twitter sharing, Facebook sharing, Pinterest sharing, total shares. In Advanced Search, there are several search options like site, fuzziness, proximity search, Boolen operators, grouping. Site wise: You can enter a domain name or domain extension in the search box to get the relevant content. Fuzziness: If you are not sure about the structure of spelling, then there is no need to worry because Fuzziness option will solve this problem and give suitable content search. Proximity Search: It will search for a document that shows a distance between Ahrefs and alerts- a new tool. Boolen Operators: You can search by Ahrefs+site name but excluding explorer. Grouping: If you are searching for group words, you can type the similar words in the search box and get the suitable result. Ahrefs content explorer facilitates to get an idea of ongoing famous content in a particular industry. Using this tool, the content developer can formulate an optimum marketing strategy, which will help businesses to achieve their goal as well improve the brand reputation. Next articleHow to Promote Yourself and Business on LinkedIn?